I found my camera cord again, I swear, I’m gunna superglue it to my computer or something. So here’s some things I’ve finished since I last saw it. 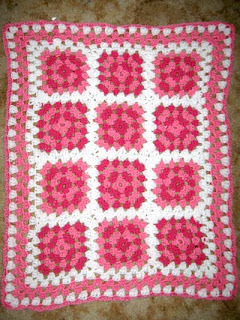 To the right is a pink and white crocheted dolls blanket I made for my niece’s birthday. I was really happy with it, only took me a couple of nights to crochet. Below is a photo from the shoot I’ve just worked on, I have to say, after all this time I still love the magic of film. That infront of you is a huge pile of lights and cables and people and gaffa tape marking spots and a big stack of props jsut around the corner, but you look at the monitor and see what the camera is seeing and it’s always so beautiful. There’s something about the way the film camera sees things that’s always magical. 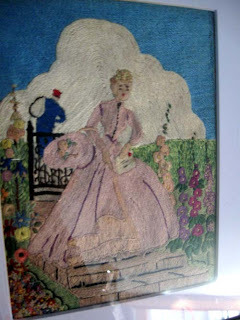 And the last thing I’ll show you today is a embroidery work that my grandmother did when she was 16 that I inherited. I’m packing a bunch of stuff into storage for a while so I wanted to photograph it while it could still see the light of day. Nan was always fond of the 1800 style of huge dresses, and obviously it was a life long fondness!